Make you very own tuffet with the fabrics you love. 3 day workshop (3 Consecutive Saturdays. We have a sample in the store for you to check out. All materials will be provided except thread and fabric. Workshop day 1 and 2 are for making your tuffet top. Day 3 is for final construction. 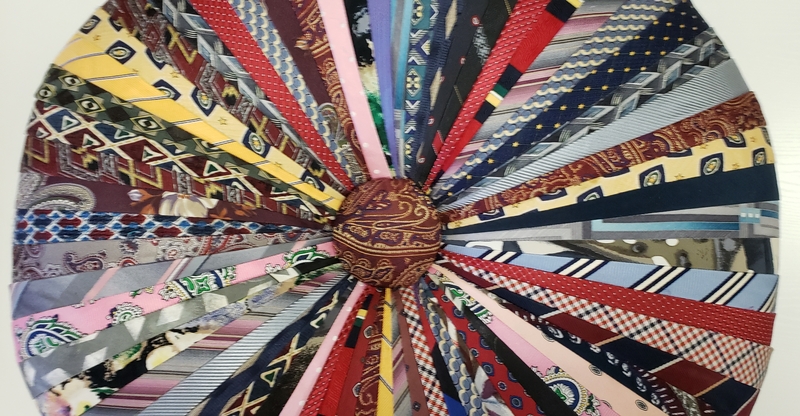 Our sample is made from vintage ties but you can use any fabric you like. 1. Sixty-four (64) 2" by 20" - 21" strips of fabric. If you want to coordinate fabrics, you will need eight (8) -1/4 yards cuts of fabric. You can bring your sewing machine or use ours. Tuffet: (N) An upholstered low seat or stool. Register online or by phone 843-665-7299. Tuffet kit includes the components to make a finished tuffet form with an 18” diameter & Tuffet in a day Foundation Pattern. Includes Tuffett Kit, Pattern and Class Fee for all three days.